A crop circle or crop formation is a pattern that is created by flattening a crop. Although claims have been made that crop circles had been reported as early as the late 1600s, there is no strong evidence for them prior to the 1970s, and the term seems to have been coined by Colin Andrews in the early 1980s. The phenomena of crop circles began in the United Kingdom, and most reports continue to come from UK, although they have been reported in Australia, Canada, the United States, Japan, and the former Soviet Union. The number of reported crop circles were greatest from the 1970s to the 1990s, but the frequency of reports has decreased in the 2000s and 2010s. Early crop circles were fairly simply affairs, generally circles, and were often believed to have been caused by UFOs in the shape of a flying saucer but, as time went on, they became more and more elaborate. Most crop circles appear overnight, although some have been reported to have appeared during the day. In 1991, two young men took credit for having created crop circles throughout England, despite the fact that one of their creations had been described as being impossible to have been made by a human hand. Today, the scientific consensus is that crop circles are created by people as hoaxes, for publicity, or as art, and that the most complex formations are made with the assistance of GPS devices and lasers. Still, there are those who believe that, while some crop circles may have been created by human hands, others were created by UFOs as messages to other extraterrestrials, or through unknown phenomena. Others have suggested that the formations may be the result of strange meteorological phenomena, such as freak tornadoes or ball lightning. Some have even proposed that the formations were done by Gaia, as a message to stop global warming and human pollution. It has been suggested that governments have created evidence of hoaxing so as to discredit the paranormal origins of the phenomena. Crop circles are large, usually intricate, patterns caused by the flattening of crops such as barley, corn, rapeseed, or wheat. Although some crop circle researchers claim that there were reported crop circles as early as 815 A.D., there are few details prior to the 1970s, and earlier reported crop circles were simple in design, as compared to the increasingly complex formations that began appearing in the 1970s and later. Early crop circles were believed, by many, to have been caused by alien spacecraft, or UFOs, landing in the fields. Prior to the late 1970s, crop circles were simple, circular depressions in crops, soil, or even snow, which appeared to have been made by a heavy object, which fit the idea that a circular craft, such as a flying saucer, could have produced the phenomena. More recent crop circles often do not fit that scenario, and are referred to as crop formations, because they are not always circular in shape. These intricately designed crop formations are believed by some to be messages left by alien beings, intended to be seen from space, while others might wonder why a being from another planet would travel to earth in order to leave a message in a corn field. Some have attributed at least some of the crop circles to a naturally occurring ring or arc of mushrooms, known as fairy rings, or fairy circles, that most often occur in forested areas, but which sometimes appear in grasslands or ranges. Fairy rings may be seen as rings of dead vegetation, or a ring of discolored grass, when the fungus is present in the ring beneath the soil. It has even been suggested that crop circles are created through ball lightning controlled by an intelligent entity, such as Gaia, as a message warning people to stop global warming and pollution. Others deny the involvement of an intelligent entity, but insist that, apart from those that were clearly man-made, most crop circles are produced by lightning discharges flowing through corn stalks, or other crop vegetation, causing them to act like magnetized compass needles, deflecting them to the ground in a clockwise or counterclockwise movement, sometimes creating intricate patterns. Perhaps the most amusing explanation for crop circles came from Tasmania, a southern island state of Australia. Australia grows about half of the world's supply of poppies, used in the production of morphine and other opiates. In 2009, Lara Giddings, the state's top lawmaker, blamed locally seen crop circles on stoned wallabies. "We have a problem with wallabies entering poppy fields, getting high as a kite and going around in circles," she said. A spokesperson for the poppy producer, Tasmanian Alkaloids, agreed, saying that livestock which ate the poppies were known to act weird, walking around the fields in circles. Apart from late-night radio and several online crop circle research sites, the prevailing belief is that crop formations are man-made. Indeed, several people have come forward to claim responsibility. 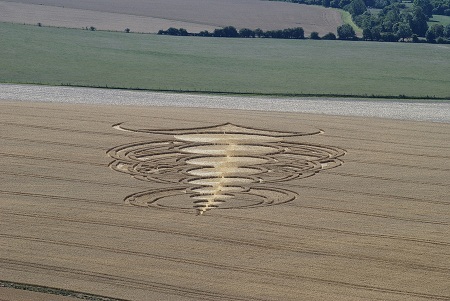 In 1991, Doug Bower and Dave Chorley claimed responsibility for starting the phenomenon in 1978, using a plank of wood and other simple materials to create several crop formations in southern England. Others have come forward to claim responsibility for other crop circles throughout the world, some of the more complex ones made through the assistance of GPS and laser technology. In more recent years, many crop circles are commissioned as works of art, particularly in the United Kingdom. What is the truth about crop formations? Surely, many of them are man-made, as people have claimed credit for them, even demonstrating the means by which they were created. However, this probably doesn't account for all of them. Formed by John Burke, William C. Levengood and Nancy Talbott, the team’s focus is on crop circle research, including the discovery, scientific documentation and evaluation of physical changes brought about in plants, soils and other materials at the sites of crop circles by the energy responsible for creating them. Plant abnormalities, magnetic materials in soils, and other studies and facts are highlighted, and crop circles may be reported through the site. A US crop circle list is included. Designed and maintained by John Lundberg, artist and circlemaker, the website offers information by and about England’s crop circlemakers, including a beginner’s guide to creating crop circles, as well as a reflection of why this tight band of individuals spend their summers in the fields of England flattening cereal crops in intricate patterns. The perpetrators are named, case histories are documented, and witnesses are presented. Anomalies are also reported. Formerly known as Crop Circle Archive, the Crop Circle Center serves as a resource for researchers and others interested in the phenomena of crop circles, also known as crop formations. The site claims to be the largest archive of crop circle sightings. Photographs, yearly statistics, diagrams and textual content are arranged by year and month, going back as far as 815 A.D. Contributions may be made through PayPal, and advertising opportunities may also be available. Available in several languages, the CCC presents an overview of crop circles, highlights recently reported circles, answers common questions on the subject, and includes a gallery of photographs of documented crop circles from around the world. A code of conduct while visiting a crop circle is included in the hope of avoiding conflicts with landowners. A guide to crop formation researchers and a schedule of conferences are posted, along with membership information and advertising opportunities. The Barge Inn, near Alton Barnes, Wiltshire, England, has long been a meeting place for crop circle tourists and fans, and the landlords decided to dedicate a portion of their home to host the facility, where visitors can hear the latest crop circle news, and enjoy homemade and organic refreshments. A multimedia display features photos of intricate and perplexing formations, and informs by text, video, and interactive maps about the history, research and theories of crop circles. Created by Dr. Jonathan Sherwood in 1992, the site is now operated by Rachel Sherwood, who has been involved in crop circle research with her partner since 1995. Audio recordings of Dr, Sherwood may be heard online. Other resources include several photographs of crop circles, with new releases and arrivals highlighted, along with newly exposed hoaxes, lecture schedules, research materials, and UFO connections. Patty Greer has produced several UFO films in the past decade, and has now turned her sights to crop circles, offering new evidence, footage and data about crop circles, making use of her own experiences as well as on her research into crop circles and UFOs. Several photos of crop circles are presented, as well as crop circle statistics, a synopsis of her films, and an online shopping area where her films may be purchased. Focusing on crop circles, the site creator, Paul Vigay, acknowledges that some circles are hoaxed, but seeks to research those that are not. Presenting scientific evidence, the site has arranged an archive of research articles, indexed by category or research area. Various suggestions as to the origins of crop circles are advanced, field reports are posted, and a biographical directory of researchers is made available. Suggested books and other references are included. CCRF is a non-profit organization that was founded for the purpose of searching for answers and educating the public about UFOs and the crop circle phenomenon, with a focus on connecting the two. Through its sponsorship of the Jesse A. Marcel Library in Helena, Montana, the group increases public awareness of these phenomena. Its advocacy insisting on public recognition of the phenomenon is detailed, along with ideas for research and video testimonies. Offering crop circle research by Freddy Silva, author of the book, "Secrets in the Fields," which is available for purchase online, along with other books by Silva. The site offers an overview of crop circles, dismissing the idea that they are a modern phenomenon, and arguing that they are being presented as hoaxes by governments in order to hide the reality of their origins. Tour dates are presented. Seeking to expose every crop circle as being a man-made hoax, the research project offers several photographs of crop circles, along with evidence of hoaxing, and answers challenges from crop circle experts who disagree with its conclusions, and discusses actions that have been taken against the project, and why the original 2011 site was closed.. A form is presented for the use of those who want to submit news or inquiries to the site authors. The annual crop circle tour is sponsored by the Institute for Resonance, offering a tour of crop circles and crop circle locations, which will differ from year to year. The highlights of the next tour are listed, along with the accommodations, food and drink. Details of the tour are posted, and interested people may register through the site, as long as space is available. Other resources include photos, information on what to bring, and a guide to sacred sites in Britain. Throughout the years, hundreds of crop circle formation have appeared, usually created during the night under unknown circumstances. The examines several of these circles, going back as far as 1994. Photos, dates, and whatever details that are known are shared for each. Recent articles are highlighted, along with examinations of the various theories, hoaxes, and other answers that have come to light. Links to related material are included. Founded by Bert Janssen, CCaM focuses on crop circle geometry and shapes, as well as the relationship between crop circles and their connection with the landscape. Available in Dutch and English, the site features maps, photos and diagrams of reported crop circles, and an extensive evaluation of the geometries found in crop circles. Speculation and theories relating to the phenomenon are included, and scheduled tours of crop circles are posted. The CCD is a non-profit project that collects objective information, photographs and video on crop circles. Arranged by year, going back as far as 1989, photos, video, and details about the crop circle are recorded, as available, and the location of the crop circle is shown on a map, and GPS data is included. Nearby formations are also noted, along with the years in which they appeared. Viewers are invited to submit photos and information for consideration. Making the argument that all crop circles have been created through lightning discharge, the site offers facts and photographs to support its theory, declaring all others to be pseudoscience or fraud. Other theories are discussed, but rejected. The site also warns that visitors to crop circles are exposed to large amounts of toxins, particularly carbon monoxide. The author points to other anomolies associated with crop circles, as well. ICCRA began as a small group of interested persons in the Midwestern United States but has grown to include people from all over the world. The organization collects and makes available verifiable knowledge and details of crop circles submitted by members and others, works cooperatively with farmers who grant access to their fields for the purpose of documentation and research, including the investigation of vandalism from crop circle hoaxers and helping to manage visitors to the sites. With more than twenty years of focused involvement with crop circles, the published author on the subject offers his observations, ideas, hypotheses, and speculations, intuitions, and commentaries, as well as disappointments. His books on the topic are presented, with synopses, and offered for sale online, as well as posters, scheduled lectures, and other resources. Informational articles and video are included. Available also as Norsk Kornsirkelgruppe, the original Norwegian language version, the site discusses crop circles, not only in Norway but in England, the United Kingdom, and elsewhere in the world as well. Photographs of crop circles are presented, with possible explanations, dates, and other data. Light phenomena and other phenomena are discussed, as are a number of related topics. A calendar of events, and recommended books and other resources are included. Steve and Karen Alexander have been photographing crop circles for a couple of decades, and are offering professional photographic images and video of crop circles for license to researchers, media, and the general public. Images and video may be browsed and purchased online. Other resources include a blog and information on visiting crop circles, as well as the Milk Hill UFO footage, and schedules of events relating to crop circles. Video, photographs, and information about crop circles throughout the United Kingdom are featured, and categorized by year, going back to 2005. When available, photographs, video and ground reports, detailing the location, crop type, design, date of first sighting, and survey date, on each are presented, with multiple photos available for some. Dan Vidler and Chris Riley offer an article detailing the reason for their interest and fascination with crop circles. The film by Suzanne Taylor examines the crop circle mystery. Based on the book, "Crop Circles: The Bones of God," written by Michael Glickman, and published in 2009, which combines the author's personal experiences with research into other famous crop-circle formations, a trailer of the movie may be viewed online, and an English or Spanish language DVD of the film may be purchased, as well as the book upon which it is based. Search for Crop Circles on Google, Bing, or Yahoo!